Eco Wind Chimes is launching its unique heart engraved slate gift just in time for Valentine’s Day ordering. The photo shown is the Brazilian Slate with a copper engraving. For a design with a sharper contrast, try the Black Vermont Slate also with a copper engraving. Stuffed teddy bears and boxes of chocolate don’t cut it when it comes to a thoughtful Valentine’s gift. 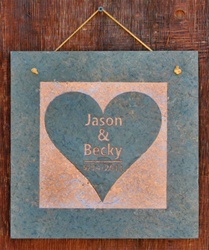 The heart slate design features the cut-out of a heart enclosed within a square. The names of the couple and an anniversary date can fit within the heart. Proposals for marriage can also be etched onto the slate. “This gift is perfect because it lasts forever. A couple can hold on to it as a piece of their history, even hand it down to their children,” continued Betzen. About: All Eco Wind Chime products are made, and sourced, in the USA. The soothing products produced by Eco Wind Chimes match the company’s dedication to quality workmanship, affordability, and purposeful retail. Eco Wind Chimes is owned by husband and wife team, Rachel & Stephen Betzen. More information, and a media kit, can be found by clicking here: http://www.ecowindchimes.com.